Beginning this Sunday (09/30) we are offering a new five-week class called Foundations. Over our history, we have discovered it is important, and extremely helpful, to provide an opportunity for people to learn more about us before committing more deeply to the life of our church (e.g. via community, service, giving, leadership, and more). Foundations was designed to serve that purpose and, therefore, function as the primary onramp into life with DCC. So, whether you’re new and curious or a long-time attender who is looking to go deeper, Foundations is for you. This isn’t merely a “hoop to jump through” but a relational opportunity for us to get to know one another in an intentional environment. By the end of the class, you will have clear next steps for how to grow and get further connected with DCC. The first class will run Sept. 30—Oct. 28. The class will run again Nov. 11—Dec. 16. We are currently planning to offer this class twice each quarter. You may jump into the class at any point—whether the beginning, middle, or end—and complete the remaining classes the next time the course is offered. For more information and to register go here. If you have any questions, just let us know. Let’s pray that the Lord would use this class to spread his glory, strengthen his local church, save souls and edify saints, while increasing our joy in him. Life in Community | Why Community? On most Thursday nights, I come home to our living room set up with all the folding chairs we own. The table is cleared of the usual place settings to make room for a potluck buffet. In a few minutes, somewhere between ten and twenty people show up, placing food and drinks on the table, catching up with each other, and marveling as the kids run in circles around it all. Is it a party, every week? Sometimes it feels that way, but in reality it’s our community gathered for quality time together over a meal, studying and discussing God’s word, and praying for one another. As we go around the circle and share the evidences of grace we’ve each experienced that week, I marvel at how quickly these people, once strangers, have become family. I reflect on how these brothers and sisters in Christ have more in common with me than many of my own biological relatives, despite some being a decade younger or older, some of a different ethnicity and race, some of a different political persuasion, and some with different educational and economic backgrounds. At times I may have preferred an evening out with coworkers, but God has used the diversity of His body to challenge my assumptions and bring fresh conviction, expand my understanding of grace, and grow me in my compassion for others. What could bring us together, week after week, to form meaningful, mutually encouraging, discipling relationships where this sort of personal change could occur? Nothing but the love of God found in Jesus Christ, experienced by us all and lived out together. In all the circles I find myself in, the bonds within the Body of Christ are the strongest. No matter how much my graduating class has shared experiences, my coworkers have shared goals, or my friends have shared interests, nothing brings together as diverse a people in as meaningful ways as the gospel of Jesus Christ. This amazing gospel brings us into a restored relationship with God and adopts us alongside others into a new family who now share a common identity. If you’re already part of a Cornerstone Community, I hope you’ll continue to press in and use your gifts for the upbuilding of those in your community. If you’ve been on the fringe of a community and haven’t been regularly connected, we’re just kicking off the year and now is a great time to jump back in. If you’ve never been a part of a Cornerstone Community, sign up for the DCC Foundations class starting this week to learn more about who we are, what we believe, and how we operate as a local family and get connected! Register here. I have come to know God in the face of Jesus by taking deeper and deeper draughts of His love over the years, usually desperate with thirst. Weary with my own failure or the evil in the world around me, I am forced to decide – do I self-medicate with spiritual platitudes and worldly comforts, or do I accept my desperate neediness and dive in to the Fountain of Life for another sweet drink of his grace? Every increase I’ve felt in my love for Jesus has directly coincided with my need of Him. These needy experiences have been tough and painful, but all have been a divine gift. Prior to officially planting Downtown Cornerstone Church, the core team completed a study on The Gospel-Centered Life. 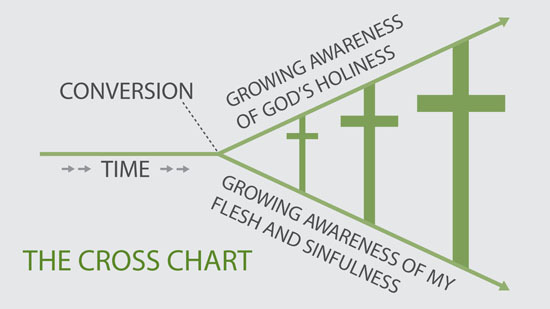 Alongside a messy group of church-planters, I remember encountering a diagram (image below) and understanding its sense completely. Yes, God’s holiness can clearly be seen in the Scriptures and the universe at large. Yes, sinful selfishness and its consequences was all around. But the impact of Jesus’ death on the cross had yet to grow greater in my life. I still maintained a small, comfortable view of my own sin and God’s holiness, despite “understanding” it. By God’s grace, the significance of the cross grew in my heart, but it took a journey of pain mixed with joy. My first pregnancy wrecked my health, energy, and emotions. Without yet feeling the little baby within, my mind couldn’t make sense of the physical consequences I was experiencing. Inwardly, I railed against God for these uncomfortable inconveniences and other secret grievances I was harboring. Instead of Christ’s grace and goodness growing greater in my heart, I was shrinking the cross by putting myself in God’s place, asserting that I knew the best way for me. While pouring out my bitterness, a friend kindly rebuked me, reminding me that indeed this trial was a good gift of God if only I had eyes to see it. Life inside of you, what a gift! But I blindly allowed his rebuke to offend my hardened heart. Fast forward one year and thousands of miles, I now had two little children in a land of snow and ice called Connecticut where God had led us for my husband, Giulian’s graduate program. Though every change is initially exciting, the thrill had worn off and we found ourselves trapped in a church that lacked any real community. Reluctantly, I joined a women’s book study, in part thinking I could teach them what genuine community should look like. Oh what pride I had! What initially softened my heart wasn’t an alleviation of my worldly burdens, or the wisdom of an excellent book, but witnessing another believer face a grave trial beautifully, by trusting in God. The group had only met a few times when Kim shared that she had just been diagnosed with breast cancer. A wife and homeschool mom to three little boys, I witnessed all her emotions and started to feel them too. She found something amidst the trial that I wanted, a profoundly deep faith in God her Maker. All of a sudden, God brought back to mind that gentle rebuke I received in my first pregnancy and I was finally able to see it as kindness. Through continued meditation and a perspective shift to see suffering as an act of grace, my love for Jesus and view of His goodness finally began to grow. I began to see that the highest form of “self-care” was in caring for others and shouldering their burdens with them and allowing them to help shoulder mine. Rather than seeking to “bounce back” after personal trials, I have received a far greater gift by submitting to trials as a force to shape my character. I recently learned that water is the single most erosive force on the planet. The Fountain of Living Water has eroded parts of my person, and in turn created something far more beautiful. The torrent of life can be overwhelming and at times discouraging, but I hope it leads us to the Everlasting Fountain again and again until we are brought there by the hand of Christ Himself never to depart again. Classes Are Coming This Fall! I’m writing to update you on an important change coming this fall: classes. Let me explain how this came about. Outside of our Sunday gatherings, the best way to to get plugged into the life of DCC is through a Cornerstone Community. In community we’re able to build friendships around the Scripture, prayer, mission, accountability, and service. Being in regular relationship with other followers of Jesus helps ensure that what we believe doesn’t merely remain in our head, but actually takes root in our lives. This is all the more important in a church of our size, where it is easy to remain unknown. But, as important as communities are, they can’t do everything in the life of a Christian. That shouldn’t come as a surprise. Nothing can do everything—not even the pulpit. Where will we learn about evangelism, or church history, or biblical theology, or counseling care, or how to disciple, or financial stewardship, or spiritual disciplines, or parenting, and more? The only answer to that is “classes.” So, this fall we are going to begin offering a handful of classes. The purpose of offering classes is not to create big heads, but big hearts. However, the way to our hearts is through our heads (Rom. 12:2). Spirit-filled thinking about God results in Spirit-filled feeling for God. After all, to “taste and see that the Lord is good” (Ps. 34:8) we must know who this Lord is and exactly why he is good. That makes learning-well crucial to loving-well—and loving is the heartbeat of worshipful change. All Christian learning should be viewed in that light. Our Foundations class is the first stop for folks seeking to learn more about DCC and/or becoming a member. The purpose of this class is to walk through what we believe (doctrine), why its important to belong (membership), who we are (vision, mission, values), why we are here (context), and how we function as a church (leadership, ministries, partners, finances, etc). This class will meet on Sundays, during the 9am gathering, starting September 30th, for five weeks (and will then repeat) and will be taught by DCC pastors and staff. This class is required for membership with DCC. This is a for-credit, or for-audit, class through CCEF (Christian Counseling and Education Foundation) that focuses on the heart-level dynamics of how people change. This class offers a combination of online and onsite training. The onsite class will meet every other Wednesday, starting October 10th, for five weeks and will be led by Lisa Pratt, a certified CCEF facilitator. Would you like to grow closer to God, but you’re not sure where to begin? This class will provide a biblical understanding of the how and why of meeting with God through the spiritual disciplines on a daily basis to grow in deeper communion with Him. This class will meet every other Wednesday, starting October 3rd, for five weeks and will be taught by Pastor Craig Sturm. Can there truly be unity and diversity in the local church? This class approaches diversity through a biblical lens, while grounding us in our unity in Christ. Teachings will address the need for diversity and unity, the role of the local church, and practical next steps for each believer. This class will meet every Wednesday over five weeks, beginning October 3rd, and will be lead by Justin Keogh, DCC’s Director of Communities and Mercy Ministries. Have you ever wondered how the church got to where it is now? This class will walk through an overview of the history of the Church. Teachings will cover prominent figures, key events, and important movements from earliest days of the Church in Jerusalem to today in Seattle. This class will meet every Wednesday, starting October 3rd, for ten weeks and will be taught by members Marco Ribeiro and James Rayment. Are you a new, or renewed, follower of Jesus and looking for a place to start? What does it actually mean to follow Jesus? This class will walk through the “basics” of what it means to be saved by God and walk in his ways, from the gospel, to listening to God, to meeting with God’s family, to living in hope. This class will meet every Wednesday (except the week of Thanksgiving), starting November 14th, for five weeks and will be taught by members Pierce Martin and Kyle Dunn. »»TO LEARN MORE OR REGISTER FOR A CLASS GO HERE. If you have any questions, email us at classes@downtowncornerstone.org. P.S. FAQs regarding classes can be found below. Q: When exactly will the midweek classes be offered? Most midweek classes will begin on Wednesday, October 3rd (be sure to check for your particular class). The building doors will open at 6:00pm. Classes will begin at 6:30pm and end by 7:30pm. Q: Where should I begin if I am brand new? Welcome! We encourage you to to jump into the Foundations class this fall. Q: Do I need to take Foundations before taking other classes? That would be our recommendation. Foundations is a soft-pre-requisite. Will we stop you from taking other classes? Of course not. But, we want you to know more about us as a church before digging in too deep, so Foundations makes the most sense as your first stop. Q: Will the classes require homework? Outside of the Dynamics of Biblical Change class, there will be no homework required in order to eliminate any potential barrier to participation. However, most classes will offer some form of optional reading and/or writing to process what you are learning. Q: Can I still sign-up if I know I will miss a class or two? Yes, please do. While we encourage you to prioritize your schedule around the class you take, in order to maximize your learning, we understand there will be conflicts. Please register and join as you are able. Q: Can I jump into a class if I don’t register? Q: Should I participate in a community or take a class? Our answer to that would depend on your particular situation. Are you new? Join Foundations. Have you been on the fringes and are now looking to get more involved? Again, Foundations is for you. Are you involved in a community yet desire to take a class? Our first recommendation would be to do both if your schedule permits (after all, most classes are only five weeks). But, if you can only do one, and really desire to take a particular class, then feel free to take a temporary hiatus from community. Or, your community may decide to take a class together. There are lots of options. Q: Will Kids ministry be offered for midweek classes? Initially, there will be no Kids ministry offered on Wednesday nights. This will allow us to leverage the Kids space for classes. However, our hope is to eventually offer Kids. If you would be interested in helping to lead, or be part of, that endeavor please let us know. Q: So, what should I do with my kids if I’d like to take a class? 3) You could make sitter arrangements or swap with another family, etc. You could also pray that we’d get a bigger building, along with a robust Kids volunteer team to staff midweek!